We are happy to inform you know that we have started enrolling students to QAD School and school will start from Saturday, October 20th. The QAD program will run under the supervision of Sheikh Abdel Hadi. 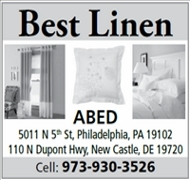 He is also our QAD principal and has designed a curriculum while keeping students who goes to public schools in mind. Our most popular program is, One (day Program that is on every Saturday from 10:00 AM to 1:30 PM. 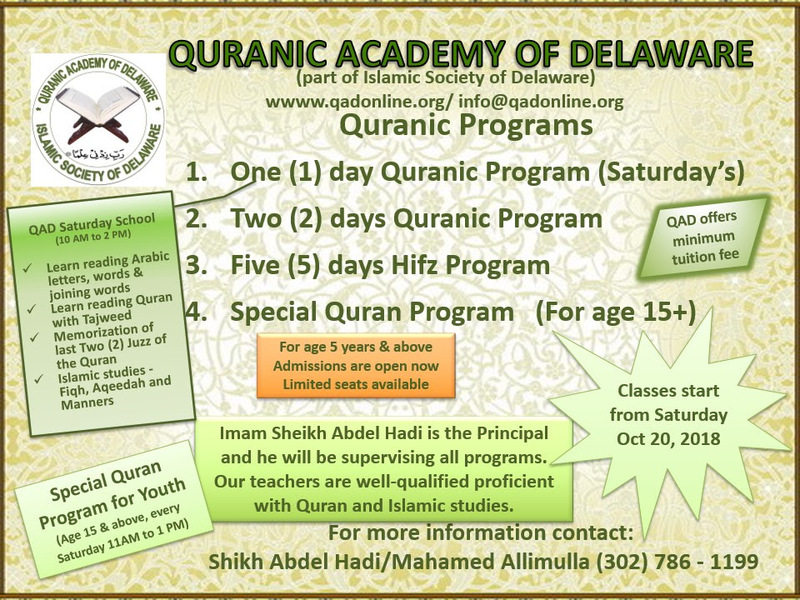 In this program we teach our students how to read Quran, basic Islamic studies and basic day to day prayers and dua’s. We also make sure that all the students know how to pray properly and for this purpose we will be having a separate Duhur prayer for all our QAD students fixed at 1:30 PM every Saturday. We encourage parents to join students for Duhur prayer every Saturday. Our teachers are trained and from time to time they send email communication about students' homework and progress to the parents. Alhumdulillah, it is with great pleasure that we inform the community that ISD General Assembly has approved the purchase of property for the Elkton Mussallah project. This is an important milestone for us as we build a new branch of ISD in Maryland. Insha' Allah it will be a starting seed for a Masjid and Community Center for the Muslims of Elkton and surrounding areas. With our growing Muslim community, the need for a bigger Masjid is becoming essential. We are pleased to announce that ISD General Assembly has approved the purchase of a suitable property up to $5,000,000, to fulfill the short-term and long-term needs of our community, as well as using the existing property as collateral for the minimum possible duration, if necessary, to secure a loan, as permissible under Islamic laws and guidance. Come join us for the next Community Family Halaqa on Friday, October 5th at 7:00 PM, InShaa'Allah. Please bring your favorite dish to share with the community. ISD will be hosting its annual Hujjaj Potluck Dinner on Saturday, September 29th at Masjid Ibrahim. This annual event gives the community an opportunity to welcome the Hujjaj and congratulate them for their blessed pilgrimage. The Hujjaj will be sharing their experiences and will offer advice on important aspects of the Hajj. This is a Potluck dinner and we encourage every family to bring a dish to share with their family and friends. 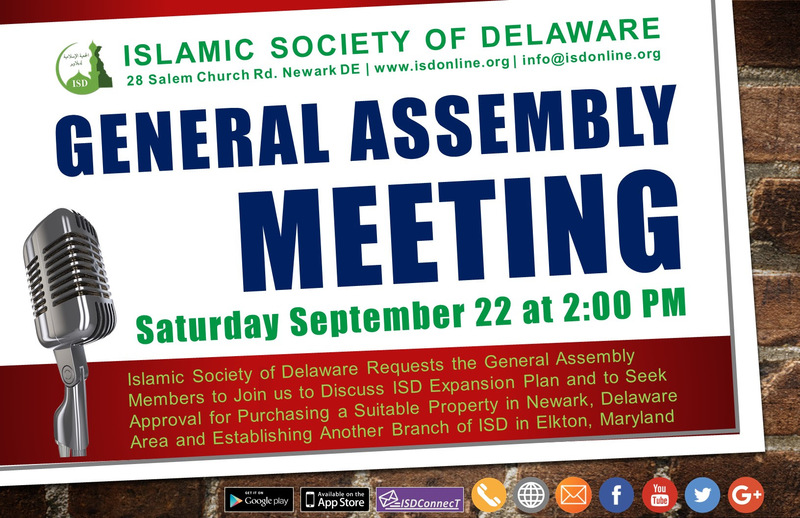 The Islamic Society of Delaware would like to invite the General Assembly Members for a meeting on Saturday, September 22nd at 2:00 PM. The purpose of this meeting is to discuss ISD Expansion Plan and seek approval to purchase a suitable property in Newark, Delaware Area. In addition, approval will be sought for establishing a branch of ISD in Elkton, Maryland. We hope to see most of our General Assembly Members at the meeting and participate in this important decision about expansion of ISD and IAD.